Our sunny weekend never materialized but that didn't stop my dear husband from tidying up the backyard (it did however stop me from raking leaves and pulling weeds). I did manage to snap a couple of pictures to share with you. My plan this spring is to pull everything out of this side garden and fill it completely with geraniums. They seem to love it in there and their happy unassuming faces always bring a smile to my face. I love a flower that doesn't mind a little neglect during the long, hot, dog days of summer. This stone walkway that rings the grass was definitely one of the deal clinchers when we first looked at our little cottage. At the end of this pathway, just as you turn the bend, there's a small waterfall and pond that adds the right amount of motion and noise to the backyard. This picture from last summer shows where we added some tall trees along the back fence for added privacy and a couple of new fruit trees for some additional shade and yummy fresh fruit. This year my hubby will be building a couple of raised bed planters for an actual vegetable plot. Nothing big to start, just enough to harvest a few tomatoes and summer veggies. I am looking forward to being more self sufficient now that I have more time (and less money) to piddle around out back. Any suggestions for easy to grow vegetables that don't take up too much room? I know I want tomatoes and peppers but would like to put in a few more basics to round it out. What about you? Have you started tilling your soil or are you still in the dreaming of spring stage? Oh your backyard is so lovely. Thanks for bring in some sunshine. It's still COLD here and the ground is covered with snow. Be sure to add some herbs, especially basil to go with your tomatoes. Baby Persian cucumbers are wonderful and if you let them grow on a trelis they won't take up room. I find the seeds for them at OSH, and they are Renee's Garden seeds. Renee's Garden seeds are a bit more expensive, but the varieties offered are wonderful. I love the seed packets and save them. Someday I'm going to decopage a wooden tray with the colorful seed packets. Your backyard is lovely and it sounds like you are really going to enjoy it this summer. Gorgeous! I love the idea of a bed of geraniums. They are really wonderful flowers and seem to last a long long time. You should grow what you eat. No point in growing something that grows well if you're not going to eat it - unless you plan to grow food to donate to a food pantry. Your garden is beautiful. I like to grow lots of Swiss Chard. It tastes like spinach and is very versatile, it grows here in NY from spring thru the fall, this year, with our mild winters, I am still harvesting. It likes cool weather, but in summer just keep it watered. You get so much for your money and can grow it from seeds. I love your back yard. We moved from southern Calif to Oregon about three years ago and sometimes I miss the mild winters down there. We're still having a lot of rain and the ground is too wet to plant. We live out in the country so I also have the deer to contend with. They love EVERYTHING! Your back yard is lovely! Love the path! I am going to start some raised beds probably with herbs and not sure what else. I probably won't start planting until March here in SC. I love the pathway around your garden. For the vegetable plot, I'd include some herbs, whatever you like (flat leaf parsley, rosemary, basil...). than any gardens I've visited. Of course I am partial to red geraniums too. There are many vining plants that take up little space. All kinds of beans, cucumbers; even squashes will vine up a trellis. It's 4 months until planting time here, so I dream about it, but that's all! 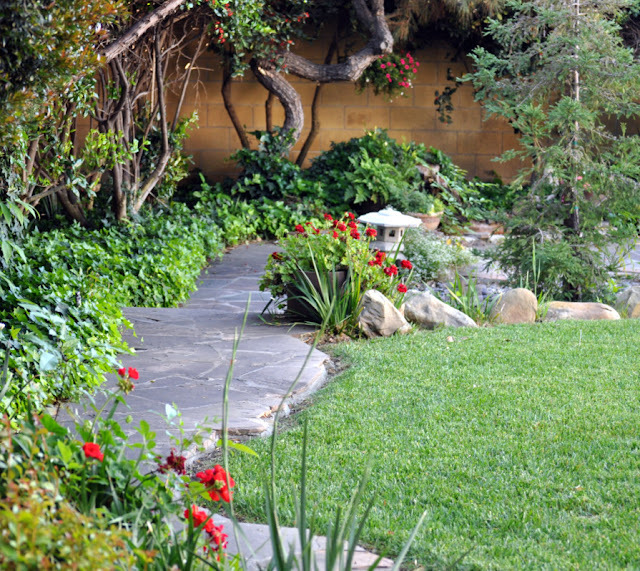 Your back yard is beautiful...love the little pathway too! My garden is still sleeping under snow. Tomatoes are about the only vegies I plant any more, but last year I tried a tomatillo plant. I got a few, but it needed a longer and wetter growing season than we have here. My herb garden is always wonderful. I love the path around your garden. What a perfectly perfect little yard... I LOVE it. So peaceful. Your're yard looks so good for this time of year. My one geraniums got frost bit. I hope it comes back. It is bright red and a favorite. I am still in the dreaming stage. Since we moved the RV about 50 ft., I lost my little garden space to the horses. But I now have a nice little place behind us to dream up a garden space. You could do herbs. Mine are all in pots and don't take up much space. Beautiful outdoor space. I've never had much luck with geraniums but love them so. 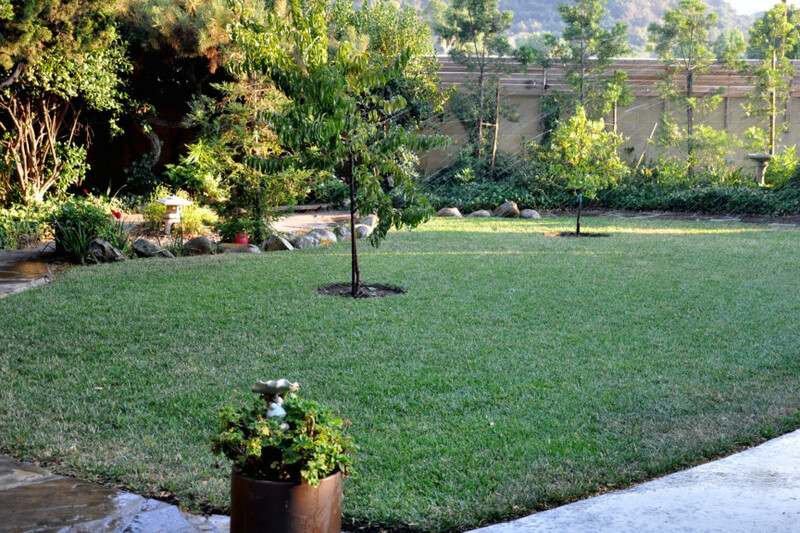 You have a wonderfully landscaped back yard, dear friend! Have you tried a few herbs? I love basil and chive...perfect in salads and with those tomatoes. One of my favoties...bread, butter and snippets of fresh chive! YuM!Fresh basil with fresh tomatoes...simply divine! Wow, your backyard is so very beautiful!! It looks so bland and barren here and that makes me feel so refreshed and happy!! 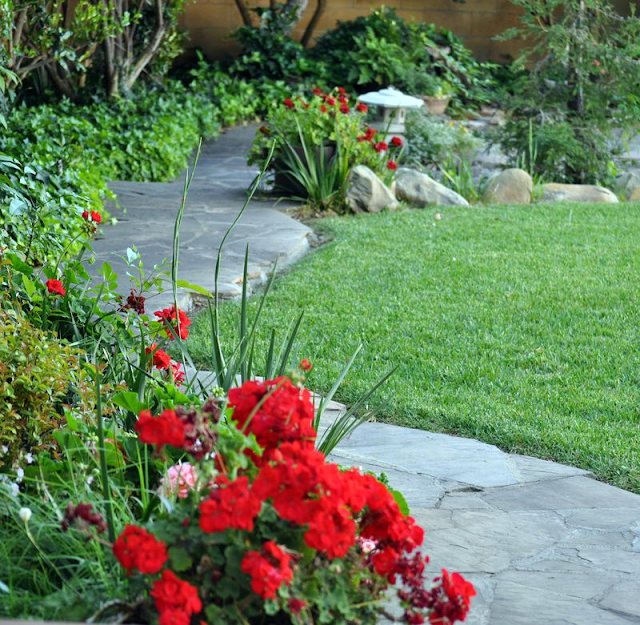 you take very good upkeep with your lawn and flowers- very beautiful job!! So pretty! It's time for geraniums to perk up my kitchen. Sadly, no yard.